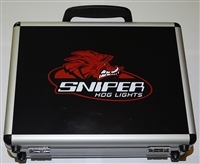 At Sniper Hog Lights, we carry a premium selection of gun mounted predator lights that will increase your shooting accuracy at night. No more struggling to see the target. Our gun mounted lights come equipped with various LED modules, of your choosing, that emit a powerful beam; extending your line-of-sight tremendously. Switch from half-power to full-power with the flick of a switch. Our LED lights are easily swappable, so you're never stuck with one color. Ready to hit your target? Take your night hunting to another level with gun-mounted lights from Sniper Hog Lights!